For example, you can create a ‘Zap’ that sends out a tweet when you upload a photo into Box.com. Or you can have Slack send a group message to everyone on a channel when you receive an email from a client. The possibilities are virtually endless. Behind each application hosted on Zapier is a layer of code called an ‘API’ (Application Programming Interface). 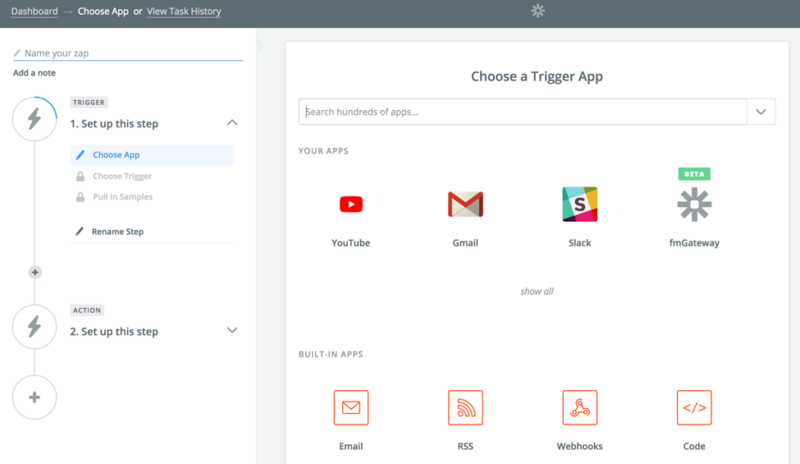 Zapier uses the first application’s API as a ‘trigger’. The idea behind the trigger is that, naturally, it gets triggered. The triggers can be such things as the retrieval of an email, an upload of a document into Google Drive, or in the case of Admin FM a server going offline unexpectedly. After the triggering event occurs, Zapier will send a request to the second application’s API, otherwise known as the ‘action’. In terms of Admin FM, you could automate a notification to be sent out if the server happens to go down. You could also use Admin FM to create a scheduled backup of your databases on the fly. Important: With FileMaker 17, the Admin API is considered a FileMaker trial feature, subject to changes and improvements, and future upgrades to FileMaker to continue functioning. So, you should expect this to also lead to future changes, improvements and upgrades to Admin FM itself. Send a message to all clients connected to all databases on our FM server. When we send a text message from our mobile phone. Go to Zapier and sign up for an account. With a free account, you can make up to 5 different ‘Zaps’. Zaps can be run 100 times per month – so it’s ideal for workflow processes that aren’t too heavy. As Admin FM is currently in beta testing as a Zap, you will need to request and accept the beta invitation from Zapier to use it. Click here to request and accept the invitation. Note: In order to leave “beta” status, Admin FM needs a minimum number of active users. We would like to squash any bugs and improve the user experience before leaving beta, so if you experience any issues with Admin FM, please refer to the contact information at the bottom of this article. Once you have access to Admin FM, you will need to authenticate your credentials with the server in order to use the API. Go to the home screen and click on ‘Connected Accounts’ and enter ‘Admin FM’. You should see the Admin FM account pop up. Click on it. Once you have done this, a new window will pop up asking you to connect to your FileMaker Server using your Server Admin credentials. Once entered, click ‘Yes, Continue’. Click on the ‘Make a Zap!’ button. This is the screen you will use to build your Zap. Zaps work on the premise of ‘Triggers’ and ‘Actions’. You choose one application to act as the trigger, and another to act as the action to occur when that trigger happens. So, to review, we want to send a message to all clients connected to all databases on our FM server, and we want it to happen when we send a text message from our phone. So the trigger event would be the sending of the text message, and the action event would be to take that text message and send a message to all clients on all servers. To begin, we have a few choices – but let’s choose to use Twilio. There are several options, but we will choose New SMS. Click ‘Save + Continue’. 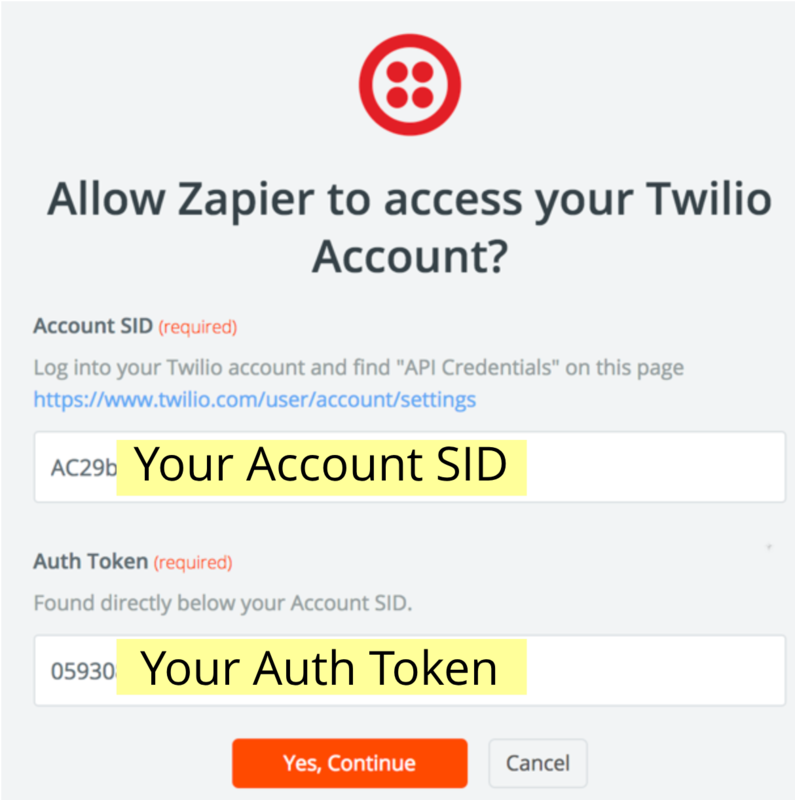 If you have not created/connected a Twilio Account, you will need to create/connect one, just like you have already done with Admin FM. Go to twilio.com and click on ‘Get a free API key’. There is one more step on the Twilio website. 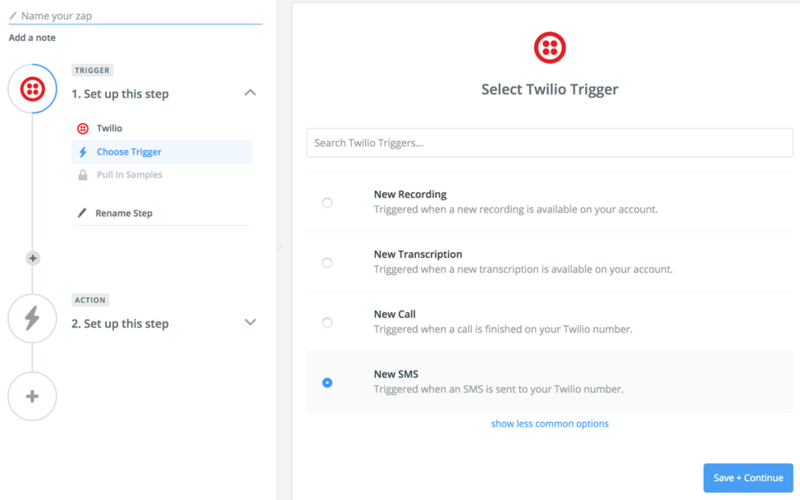 On the Twilio Dashboard on Twilio’s website, click on ‘Programmable SMS’, and select Get Started. 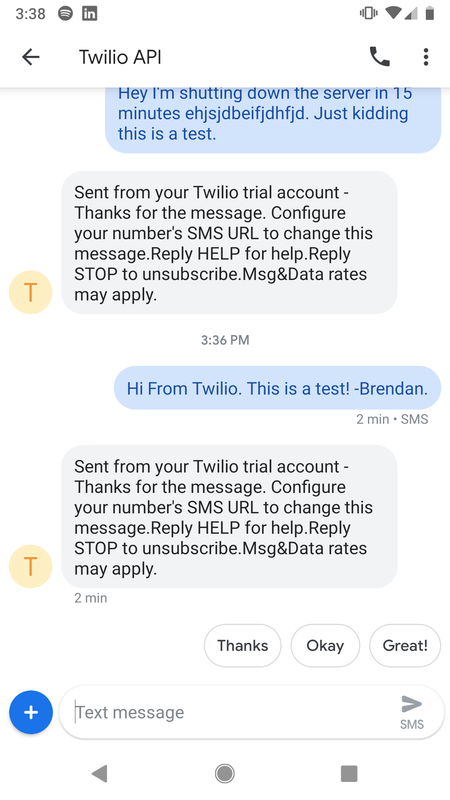 Again, follow the instructions to get a Twilio phone number. This is the number we will use to Trigger the Zap to happen. If you refresh the ‘Edit Options’ page, you should be able to see the new phone number in the drop-down menu. Lastly, we need to send a text with a message to the Twilio number to confirm it’s working. Once you’ve sent a message click on Fetch & Continue to view the SMS text that was received. Now it’s time to define the Action. In short, we want FileMaker to send a message to everyone connected to the FM 17 Server when we receive that text. Select the ‘Admin FM (1.0.0)’ beta app. On the next page you will see a big list of Admin API functionality. Select ‘Send a Single Message to All Clients’. Follow the on-screen dialog options to connect your Admin FM account. Next, choose the ‘Body’ as the ‘Message Content’ that will be sent to all connected FileMaker Server clients. On the next page, test your Zap to see if it works. Once everything is set up you are ready to name your Zap and begin using it! Send a message from your phone, and watch it pop up in your FileMaker solution. You may have to wait a few minutes (as many as 15), as Zapier polls Twilio to see if any new messages have arrived, however there are other implementations that are instant. Zapier is a unique platform in a couple ways. It simplifies the use of many different APIs and boils down seemingly complex interactions into a series of simple-to-follow instructions. This allows for a great deal of accessibility and flexibility in the way you approach integration. There are a huge number of applications available, and while a free Zapier account will only allow up to 100 Zaps a month, it’s enough for testing and simple tasks. Admin FM only integrates FileMaker’s Admin API, but a similar method could be used to integrate Zapier with FileMaker’s Data API. My hope is that developers continue to explore and innovate, and expand the possibilities available using Zapier and FileMaker together. As of this post, the FileMaker Admin API is considered a FileMaker trial feature, subject to changes and improvements, and future upgrades to FileMaker to continue functioning. 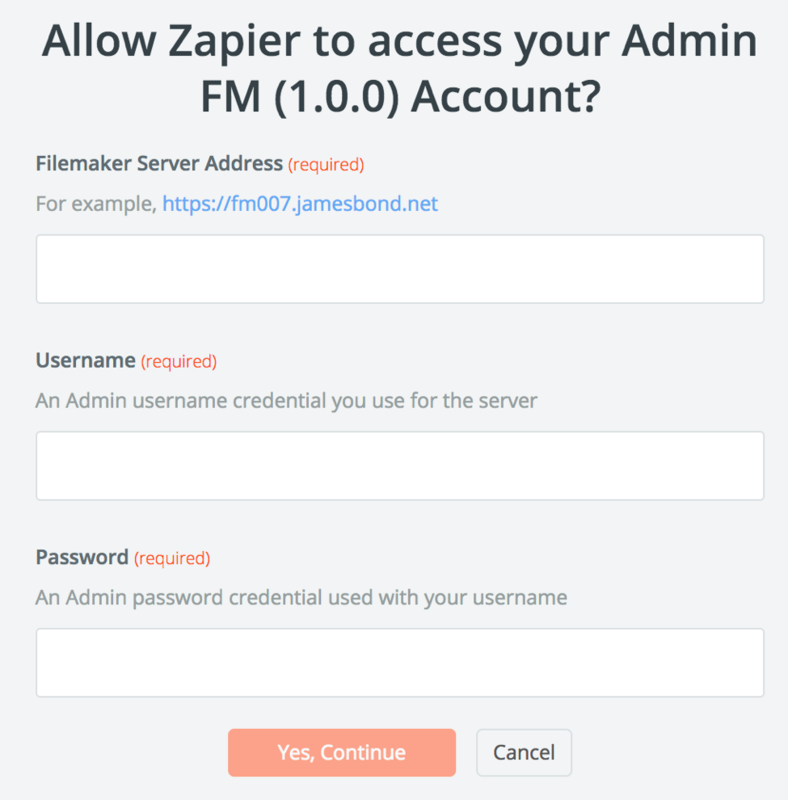 So, you should expect this to lead to future changes, improvements and upgrades to Admin FM for integration between Zapier and the FileMaker Admin API. As a reminder, Admin FM is in beta testing as a Zapier app (aka a “Zap”). To participate in the beta program please click here to create a Zapier account and accept the beta invitation. The full source code for Admin FM’s Zapier implementation is available on GitHub. Please do not hesitate to contact us if you are interested in contributing to the project! FileMaker is a trademark of FileMaker Inc., an Apple subsidiary, registered in the U.S. and other countries.